Chandlers Plumbing provide a professional central heating or underfloor heating installation service across Hampshire & fit various radiator styles & can also service your central heating. 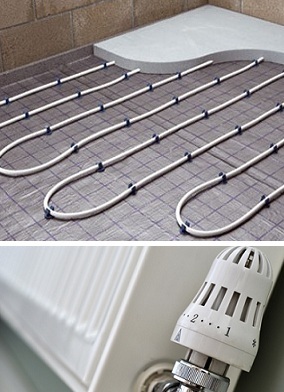 Most modern houses in the UK have a central heating system to heat their home and provide hot water for washing. A modern system with a condensing boiler is a highly energy efficient, practical way to provide warmth for your household, and is ideal for the majority of people. We can ensure that you get a central heating system tailored to your individual family’s needs. For your peace of mind we only install A-rated condensing boilers which are the most efficient on the market (unless it’s not technically possible). We are an established company with a wealth of experience, and our highly trained engineers are Gas Safe registered. We’ve been working with central heating for years and have all the expertise necessary to deal with both simple and complex heating needs. For great deals on new central heating systems, don’t hesitate to call Chandlers Plumbing. Our goal is to deliver a better quality of service and offer better prices than any other central heating company in your area, so you can be assured that you’re getting the best deal possible. Covering Southampton including Chandler’s Ford, Eastleigh, Romsey, Hedge End, Netley Abbey and beyond.